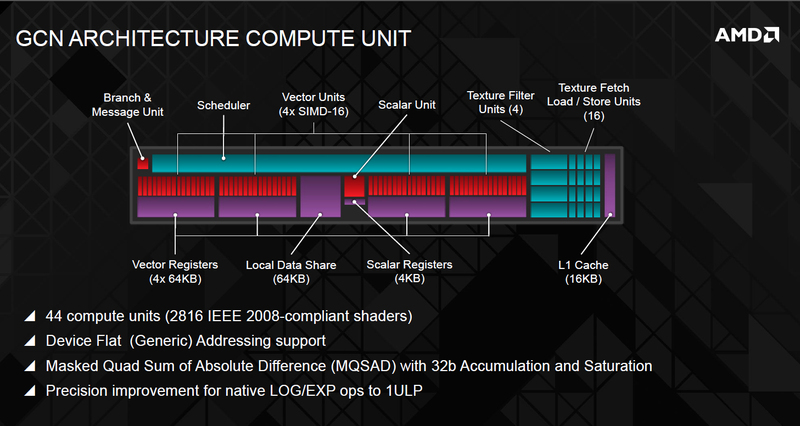 Update – AMD has asked us to removed this content piece due to their NDA regarding the Hawaii GPU. 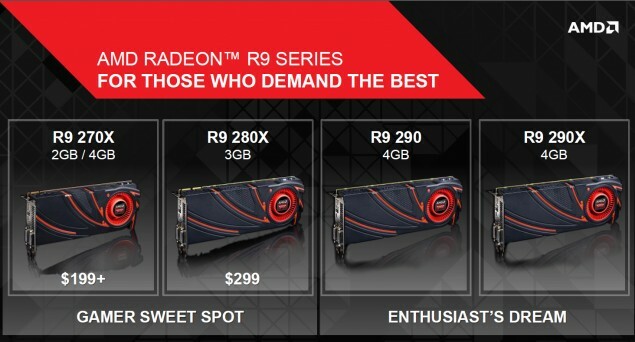 The article and its content would go live once the NDA is over or the product has officially been launched and announced by AMD. 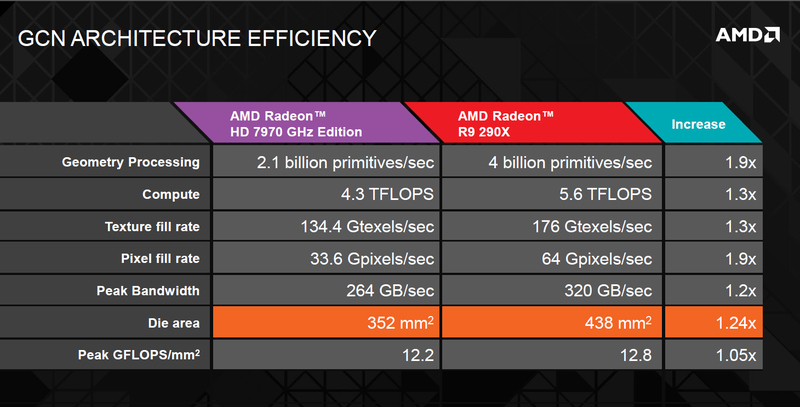 The block diagram of AMD’s next generation Radeon R9 290 series ‘Hawaii GPU’ has been. Only recently did we have a chance to detail the full technical specifications of the Radeon R9 290 series unfortunately we had to take the article down due to our NDA with AMD but now we get to look at the integral architecture changes the Hawaii chip features over its predecessor Tahiti. 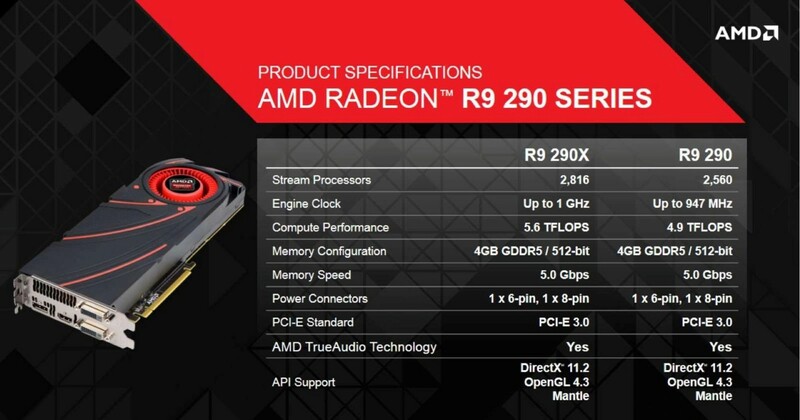 The Radeon R9 290X and Radeon R9 290 would both feature the Hawaii GPU architecture. The Hawaii chip measures at a 438mm2 which is larger 24% larger compared to the Tahiti chip which measures at 389mm2. 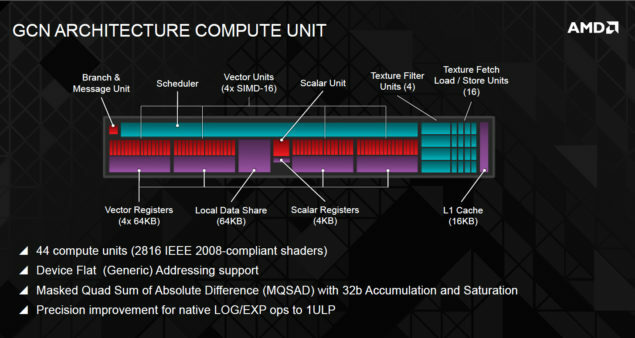 AMD spent alot of time tweaking and organizing their Hawaii chip since that was the only chip they have been actively developing since the launch of the last HD 7000 series cards which was a long time ago hence we are looking at a complete departure from the older GCN 1.0 design in the GCN 2.0 Hawaii architecture. The Hawaii block diagram shows that the core consists of eight ACE ‘Asynchronous Compute Engines’ modules which is twice the amount featured on Tahiti, right in the middle of these modules is the main graphics command processor to allow global data share. 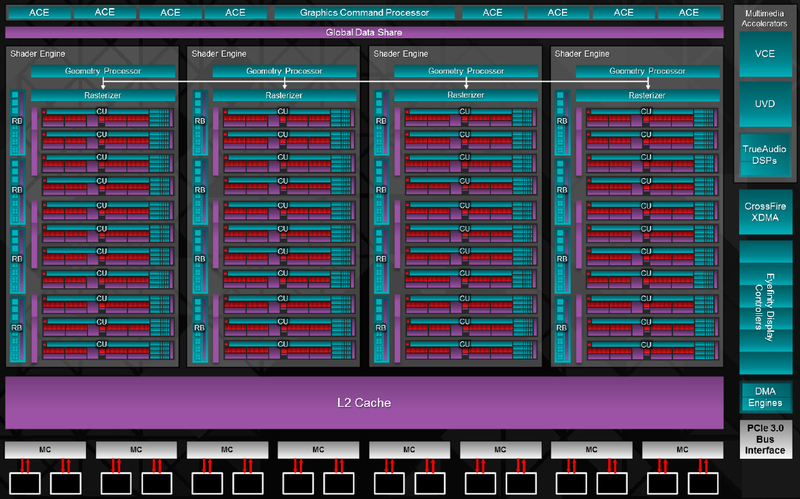 The Hawaii GPU consists of four Shader Engines each with its own parallel linked geometry processors and Rasterizers, each Shader Engine hold 11 Compute units with 64 Stream processor count, the full Radeon R9 290X Hawaii GPU comes with 44 Compute units and a shader count of 2816 streaming processors, 176 Texture mapping units and 64 Raster operator units. 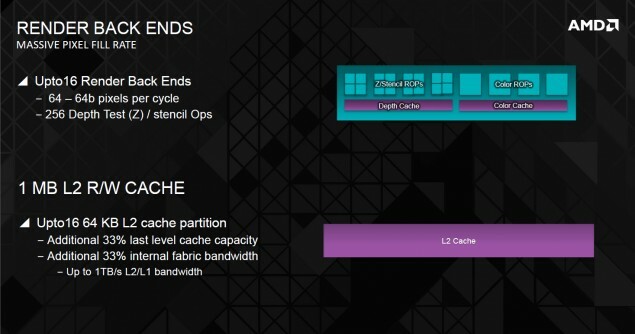 All Shader engines share the same pool of 16 64 KB L2 Cache with upto 1 TB/s L2/L1 bandwidth. 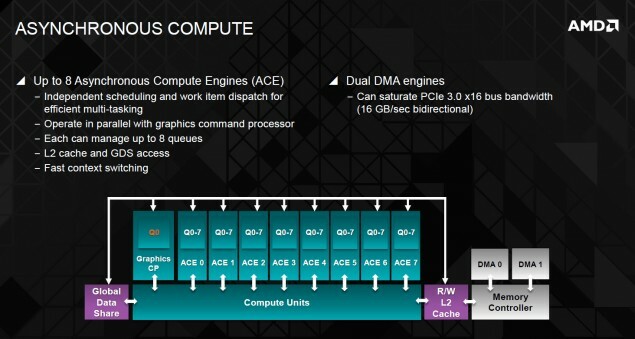 The Hawaii GPU has eight 64-bit MCs or memory controllers which result in the 512-bit bus interface with an abundant 4 GB GDDR5 memory. 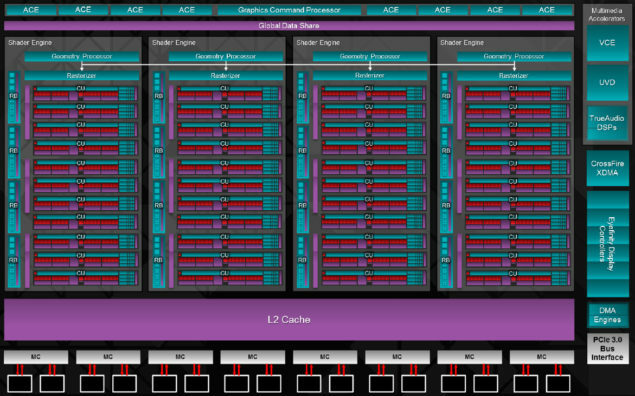 Multimedia processors are featured along side the main GEs that include VCE, UVD, DSPs for TrueAudio, XDMA, Eyefinity Controllers and the DMA engine. Last of all, a small PCI-e 3.0 Bus interface is located which enables support with the latest PCI-e 3.0 enabled motherboards. 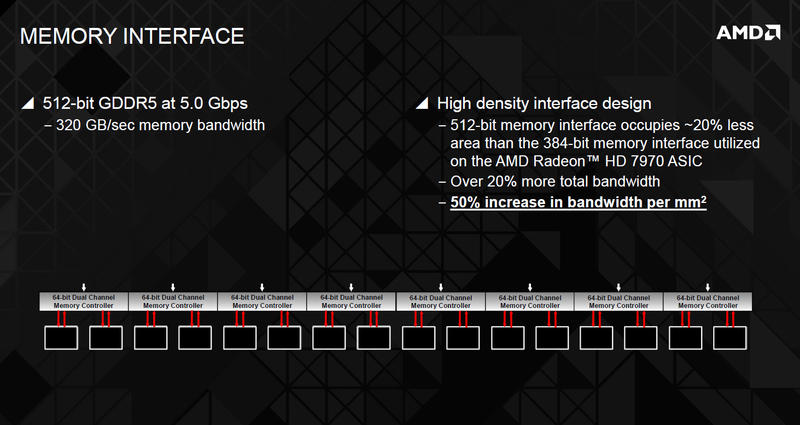 A GCN 2.0 architecture efficiency slide shows the main improvements between Tahiti and Hawaii and we can note that the geometry processing rate has been increased by 1.9 times with 4 Billion primitives per second on Hawaii compared to 2.1 Billion on its predecessor. Similarly the texture and pixel fill rate have been upped by 30 and 90 percent respectively while the bandwidth is rated at 320 GB/s compared to 264 GB/s on the HD 7970. Lastly, on the compute side users would get 12.8 peak GLops/mm2 compared to 12.2 on Tahiti. The Hawaii Radeon R9 290 series has a larger die size of 438mm2 so we are expecting upto 5.6 TFlops of compute performance. AMD’s Hawaii Radeon R9 290 series launches next week, stay tuned for more info.